What do young children “need” when they are bored, sleepy, sad or hungry? How about when they are angry, confused or excited? Kids do know what they need. Babies are born eager to communicate, to cry, fuss, or steal our attention with big doe eyes. It’s the dance of attachment that we listen and we respond honoring their unique preferences – does the baby want to be held this way or that way? Does the baby want to rocked or snuggle with Zen-like silence? From the very beginning, children tell us what they “need” and we try to find the magical connection between need and fulfillment. We guide and we teach, giving them everything they need…without over-feeding, under-sleeping, over-stimulating, under-stimulating, too much push or too much pull. Together baby and loving caregiver learn what works best. The tuned-in grown-up stays present, listening and learning as an infant’s needs become intuitive and transparent. Then, at 18 months with the first “NO” and “MINE”, deciphering what a child’s “needs” gets a little more complicated. And by the 3’s, with potty power and power struggles, the dance between parent and child can become a battle for who leads and who follows. Developmentally, the child is ready to learn what they need – mostly because they refuse to let anyone else decide for them. And yet, they can’t manage this social-emotional journey alone. The confusion in kids’ thinking can be heard in a fabulous song by Wendy Gelsanliter, I’m Hungry, I Need a Band-Aid: “I’m bored, I need a Band-Aid. I’m sleepy, I need a Band-Aid, I’m sad, I need a Band-Aid. I’m hungry, I need a Band-Aid.” Kids know they need something! A Band-Aid is the magical, make-it-feel-better, fix-everything solution. Children must go through a very personal process of exploration and discovery to figure out what they need in an emotionally volatile situation. It takes time, practice, experience and wisdom to figure out emotional needs: Do I need a Band-Aid or a hug? Do I need a Band-Aid or a minute to calm down? Do I need a Band-Aid or a crazy-releasing temper tantrum? No one else can tell a child exactly what he or she needs because one person’s strategy may not work for another. Just read Mouse Was Mad by Linda Urban to see what goes “wrong” when the other animals try to tell a little mouse how to release his anger. And how “right” it is when he discovers his own way. 1. Listen and watch without trying to be a fixer. Try to understand your child’s experience here – not the grown-up, rationale, efficient explanation but instead the contradictory, push-pull, overwhelmed, lashing out, melting down, true child experience. 2. Pause – take 3 steps back to create a safe space to “hold” your child’s emotions. When your child is excited or falling apart, they need a calm person to create a safety net around them – a lifeline to keep them from falling deeper into the abyss. 3. When calm, ask what they need right now. Just posing the question creates an opening for awareness, for a choice. Even a 2 year old, who is too young to know or to verbalize, will know the question presents a way out of the emotional quicksand. 4. Practice creating options. Do you need a minute to get calm? A hug? 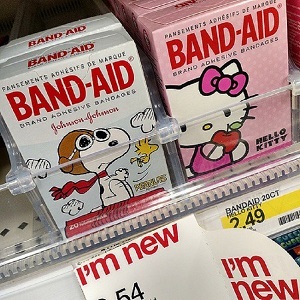 A Band-Aid? Children’s books and music are great age-appropriate resources. 6. Teach choices. Positive Discipline.org has a “wheel of choice” to help children visualize problem solving options. Children decide for themselves effective communication and behavior choices. For example: asking someone to stop, try again, go to a cool off spot or count to 10. 7. Be prepared to guide your child to effective choices or shut down ineffective choices. Of course, he NEEDS to smack his sister when he’s angry but that is definitely not an effective choice. Children’s problem solving ability is directly proportional to parent’s problem solving ability. So best to begin and end with improving your own emotional intelligence and mindfulness. When in doubt, you can always try a Band-aid!